Our bodies are like machines. A problem in a small part can bring the whole contraption down. That is why it is important to be watchful and take care of the body as a whole. Hydronephrosis is one of the many problems our bodies can encounter in a lifetime. And if it affects your baby, the worry is pretty understandable. Do you want to know more about this painful condition? Then read this post to understand more about hydronephrosis in children. Hydronephrosis affects 1 in every 100 children in the USA (1). It can cause one or both kidneys to become swollen due to the failure of normal urine movement from the kidney to the bladder. In most normal people, urine flow is effortless. But in case of Hydronephrosis, pressure builds up in the kidneys, and they can become engorged. Without treatment, this can even lead to kidney failure. The first thing to remember is that Hydronephrosis is not a disease. It is the result of several conditions that affect the kidney and the kidney urinary collecting system. 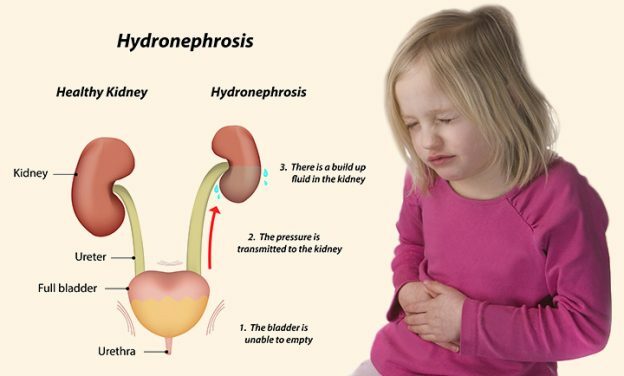 In most cases, Hydronephrosis develops because of a blockage in one of your child’s ureter. This condition is called Acute Unilateral Obstructive Uropathy (2). A kidney stone is most often the cause of this blockage. But a blood clot can also be the cause in some cases. ACOU can cause Vesicoureteric Reflux too, where urine flows back into the kidney and leads to swelling (3). Many children develop Hydronephrosis due to a problem in the ureteropelvic junction (4). Sometimes, tumors near or around the ureter too can cause Hydronephrosis in children (5). Many babies are born with birth defects that too can lead to narrowing of the ureter and can cause this serious condition (6). 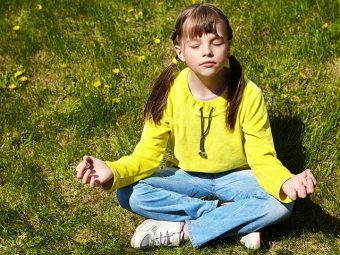 If you notice your child experiencing the symptoms mentioned above, see a doctor. If left untreated, Hydronephrosis can lead to serious consequences, including pyelonephritis and sepsis (7). So it is important to seek medical help as soon as possible to help your child recover faster. Your child’s doctor may use various diagnostic tools, apart from a physical exam, to diagnose Hydronephrosis. An ultrasound or a CT scan is commonly used to detect this condition. Your physician may insert a ureteral stent to allow the ureter to drain into the bladder. Nephrostomy tubes are considered to be the best option for treating Hydronephrosis caused by stones (8). A course of antibiotics can help treat UTI, a common symptom of Hydronephrosis (9). In case a blood clot, stone, or congenital defect is the cause of your child’s Hydronephrosis; your doctor may recommend surgery. A laparoscopic surgery can help deal with Ureteropelvic Junction Obstruction (10). Your doctor can also opt for an endoscopic surgery for the removal of kidney stone causing the obstruction in your baby’s bladder or ureter (11). Endoscopic surgery is a better option as it allows your doctor to remove the stone without scarring the kidney and help your child recover faster. Be it mild Hydronephrosis in children or severe, you’ll have to deal with the causes that lead to this condition in a timely fashion. If your child has vesicoureteral reflux, treat it as soon as possible so that it does not lead to Hydronephrosis. Same thing applies to stones, blood clots, and congenital defects. Children are fragile. Their immune systems are still maturing and their health is under constant attack. You live with constant anxiety as a mother and wonder where the next assault would come from. But you cannot live under constant stress. It will do you no good. What you can do is be ready with information. Knowledge is power. So, arm yourselves and help your child deal with this common but painful condition. Was this article helpful? Do send in your feedback in the comments section below!